Unfortunately, no, i can't be undone. 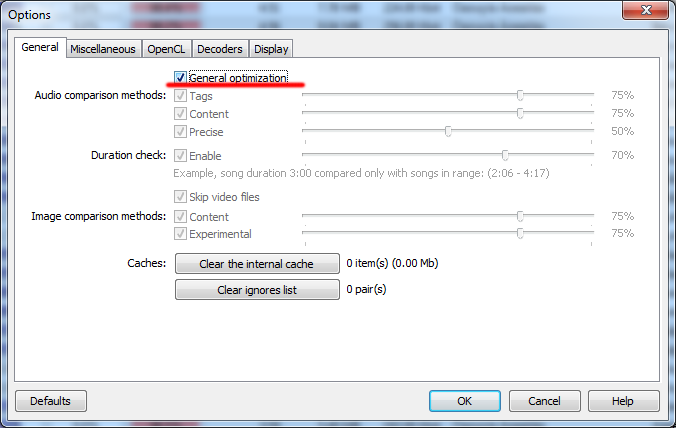 You can start scan again it speeds up by using caches, Similarity doesn't decode cached files again. And try to use "General optimization" it speeds up significantly. Wishlist / Re: How to create Symbolic link (Softlink or Shortcut) before deleting Marked items? Similarity has no functions to make symbolic links. We think about this feature in future. General / Re: What happened to "Rearrange Groups"? 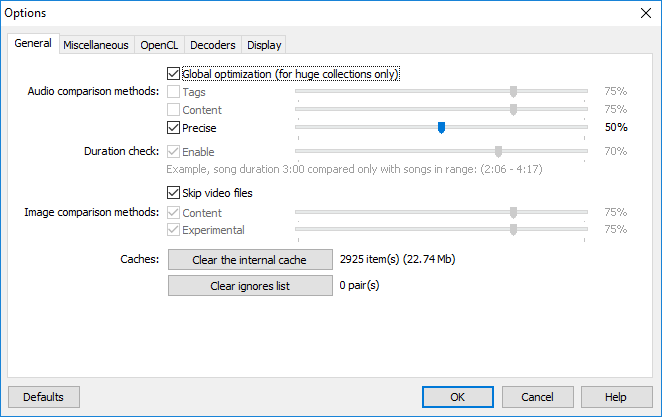 General / Re: Change cache location? Can you just move Similarity to cache folder and launch in portable mode "-portable"? Bugs / Re: "Move Marked" doesn't work, Nothing does work! Please, check permissions on your files, Simialrity can't move them because lack of permissions. This version contains new global optimization algorithm which increase scanning speed drammatically. It's specially designed for users with collection containg 5000 files and more, for smaller number of files it has no effect, even scans slower. Normal scanning of Similarity has N^2 complexity, new algorithm has N complexity (linear). Example if scanning N files took T min, scanning 10 times more files with old methods take 100 times more time, but with new one only 10 times more. And this is without need of duration check. Scanning takes 2 steps (fills percent bar two times): first indexing (no duplicates shown), second comparing (duplicates filled). - Algorithm cannot be continued after exit and restart of program, you need to restart it. - No old content algorithm (it's no needed). yes we release it on Mac too, but I can't tell the exact time of release. This version contains new global optimization algorithm which increase scanning speed drammatically. It's specially designed for users with collection containg more 5000 files, for smaller number of files it does has no effect, even scans slower. On Intel I7-2600 CPU scanning 60000 audio files, previous version of Similarity with default settings took 12h 50min, new version with general optimization took 2h 32min. Also new algorithm found for 100 duplicates more, because no duration check limitation. For more files this new version scans even faster, because it's complexity is linear time, while old method complexity is squared. Scanning take 2 stages (fills percent bar two times): first indexing (no duplicates shown), second comparing (duplicates filled). Algorithm is still in beta stage, not optimized very well. Algorithm cannot be continued after exit and restart of program, you need to restart it. Uses modified version of 'Precise' algorithm (doesn't matches with current version). No old content algorithm. 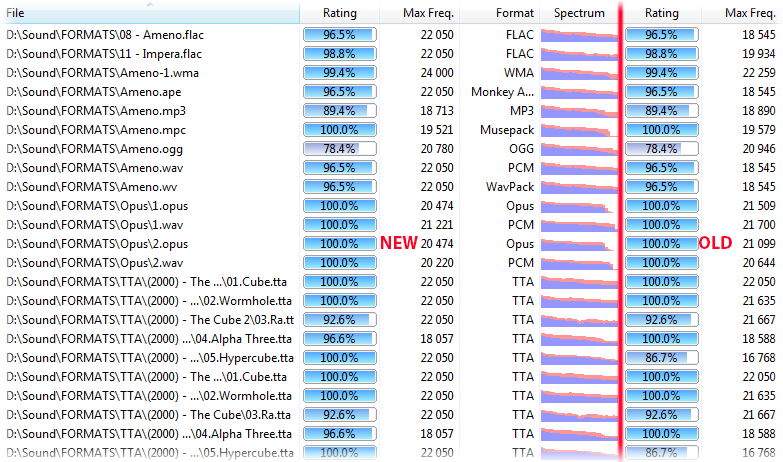 In the content score field shown raw score of indexing algorithm (shown for debug purpose only), can be easly ignored.